After giving us an informative introduction, Joshi has arranged Dunsany’s stories into six sections. The first and longest section, which he calls Pegana and Environs, contains Dunsany’s stories about Pegana, an imaginative land inhabited and controlled by a cast of remote and frivolous gods. These fables, written in a formal and elaborate style and often sounding like the King James Bible, are slightly reminiscent of the tales about the Greek and Roman pantheons (yet more amusing) and include origin stories as well as tales of the gods meddling with humans and amongst themselves. While reading them I found myself thinking of Tanith Lee’s TALES FROM THE FLAT EARTH and Italo Calvino’s Invisible Cities. In these stories we visit many exotic places and meet a sentient sword, a creature who asks for a soul but ends up regretting it, a man who sets out to prove that ghosts don’t exist, singing flowers that are the dreams of poets, a wise talking cat, and a centaur. I liked the style, content, and diversity of these stories better than the Pegana fables. These are very short, most just a couple of minutes in the audiobook version. Here we meet a man whose dead body keeps getting re-buried while he’s aware of it, a man who falls off a scaffolding and tries to carve his name on the way down, and a king who swears to visit a city that a prophecy claims he’ll never reach. Some of these poems are clever, some are thoughtful. They’re all beautifully written. “Roses,” a poem of only a few lines, is a good example of one of Dunsany’s common themes — that nature will continue to thrive long after humans manage to exterminate themselves. These stories were my favorites. One is about a very expensive window that looks out onto a captivating imaginary city. Another is about a businessman who, with half of his brain, competently and logically does his job and, with the other half of his brain, lives in his own fantasy world. In another story we visit a city that only appears when you drink rum, and in another, we visit a shop where traders can swap the bad things that happen to them. There are some repetitive elements in these stories, but they’re all clever and amusing. Jorkens tells the fantastical tales as if they’re true, so his listeners are never quite sure how much to believe. In these tales, Jorkens visits Mars, puts an elephant in a matchbox, gets chased by a tree, and explains how the man who just rode by their club in a carriage is actually a satyr. These stories were a lot of fun and I’ll be seeking out more of the Jorkens tales soon. This is a diverse set where we see what would happen to London if all the humans were gone, we solve a murder that involves a relish-eating vegetarian, we watch a dog start putting on airs, we witness the consequences of offending “the little people,” and we watch some meddlesome boys use torpedoes to sink toy boats on a public pond. These stories, which wouldn’t be classified as fantasy, are entertaining and sometimes exude sardonic social commentary. It’s easy to see why Lord Dunsany was such an important influence on Tolkien, Lovecraft, Le Guin, Moorcock, and others fantasy writers. 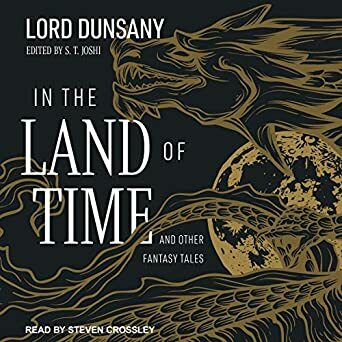 Any reader who is interested in the history of fantasy literature should become familiar with Lord Dunsany’s writings and In the Land of Time: And Other Fantasy Tales is the perfect method for doing so. Tantor Audio’s new edition is exquisitely performed by Steven Crossley. I highly recommend it. Print published in 2004, Audio in 2019. A pioneer in the realm of imaginative literature, Lord Dunsany has gained a cult following for his influence on modern fantasy literature, including such authors as J. R. R. Tolkien and H. P. Lovecraft. This unique collection of short stories ranges over five decades of work. Liberal selections of earlier tales – including the entire Gods of Pegana as well as such notable works as “Idle Days of the Yann” and “The Fortress Unvanquishable, Save for Sacnoth” – are followed by memorable later tales, including several about the garrulous traveler Joseph Jorkens and the outrageous murder tale “The Two Bottles of Relish”. Throughout, the stories are united by Dunsany’s cosmic vision, his impeccable and mellifluous prose, and his distinctively Irish sense of whimsy.